Artist's concept of the 11.2-billion-year-old star Kepler-444, which hosts five known rocky planets. 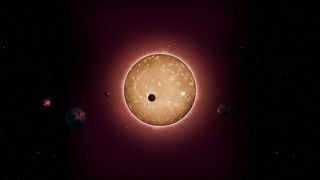 Five rocky alien worlds that are 80 percent as old as the universe itself have been discovered, suggesting that Earth-size planets have been a feature of the Milky Way galaxy almost since its beginning. The newfound exoplanets circle Kepler-444, an 11.2-billion-year-old star about 25 percent smaller than the sun that lies 117 light-years from Earth. All of the worlds are Venus-size or smaller and are therefore rocky, though scientists know nothing else about their composition. "We now know that Earth-sized planets have formed throughout most of the universe’s 13.8-billion-year history, which could provide scope for the existence of ancient life in the galaxy," lead study author Tiago Campante, of the University of Birmingham in England, said in a statement. For perspective, Earth and everything else in our own solar system formed about 4.6 billion years ago. Campante and his colleagues discovered Kepler-444 and its five known planets after analyzing data gathered by NASA's Kepler space telescope. Kepler hunts for planets by noting the tiny brightness dips caused when they cross their host star's face from the spacecraft's perspective. Kepler can also pick up brightness changes caused by sound waves within the star that affect its temperature and thus its luminosity. Studying these natural oscillations — a strategy known as asteroseismology — can help scientists determine a star's size, mass and age. "When asteroseismology emerged about two decades ago, we could only use it on the sun and a few bright stars, but thanks to Kepler, we can now apply the technique to literally thousands of stars," said co-author Daniel Huber, of the University of Sydney in Australia. "Asteroseismology allows us to precisely measure the radius of Kepler-444 and hence the sizes of its planets," he added. "For the smallest planet in the Kepler-444 system, which is slightly larger than Mercury, we measured its size with an uncertainty of only 100 kilometers [62 miles]." The $600 million Kepler mission launched in March 2009, tasked with helping scientists determine how commonly Earth-like planets occur throughout the Milky Way. The spacecraft has discovered more than 1,000 explanets to date, with more than 3,000 additional "candidates" awaiting confirmation by follow-up analysis or observations. Kepler's original planet hunt ended in May 2013, when the second of its four orientation-maintaining reaction wheels failed. But scientists are still combing through the instrument's huge data set, as the new study shows. And Kepler has embarked upon a new mission called K2, which is continuing the exoplanet search but also includes observations of other cosmic objects and phenomena. The new study was published today (Jan. 27) in The Astrophysical Journal.